Hard floor and upholstery cleaning technicians: NCCA [National Carpet Cleaners Association] trained. 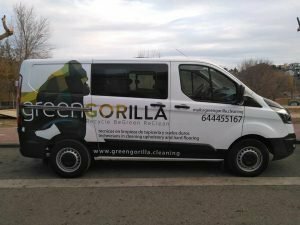 Fully trained in stone restoration and hard floor cleaning, Green Gorilla provide more than just a spring clean, they can deep clean tiles and grout, seal for protection and dress for low maintenance and future care. They also deliver great results on grout haze removal. They also clean upholstery, rugs and mattresses. They deliver a 6 stage cleaning process: assessment, back beating (rugs), vacuum, pre-spray with appropriate cleaning solution for the fabric and fibres, agitation and finally extraction to ensure a thorough hygienic clean. They are professional, punctual and strive to deliver exceptional standards. The company is eco friendly and use allergy sensitive solutions where possible.